Scientists Undeterred By Hubble Successor's Costs A recent independent review said the James Webb Space Telescope will cost about $1.5 billion more than the $5 billion NASA had planned to spend. But the telescope will be able to peer at the very first galaxies and reveal parts of the universe that have never been seen before. The successor to the Hubble Space Telescope is facing cost overruns and years of delay before it launches, but that hasn't dampened the enthusiasm of scientists who are meeting in Baltimore this week to talk about the amazing research they want to do with the James Webb Space Telescope. "What I want to look at with Webb is what we call ice giants in our solar system — the planets Neptune and Uranus," says Heidi Hammel of the Association of Universities for Research in Astronomy, a consortium that operates large observatories. "I've been studying these planets for 20, 30 years now, and we've really pushed the limits of what we can do from the ground and with Hubble." Cost overruns and production delays aside, NASA has big plans for the James Webb Space Telescope once it is finally completed. Designed to peer deeper into space than ever before, the observatory will detect longer wavelengths of light and be more sensitive than Hubble. Proposed Launch Date: Originally targeted for 2011, NASA now says the telescope is unlikely to launch before 2018. The James Webb Space Telescope, named after a NASA administrator during the Apollo days, is designed to push past those limits and others. The telescope, which is bigger and more powerful than Hubble, will be able to do things like peer at the very first galaxies, search for water on planets that orbit distant stars, and reveal parts of the universe that have never been seen before. All of that comes with a big price tag. A recent independent review said the telescope will cost about $1.5 billion more than the $5 billion NASA had planned to spend. While it was supposed to launch in 2014, it's looking like 2018 at the earliest. Hammel seems unfazed by these setbacks. "It's clear that it's hard to build," she says. "But you've got to do hard things, because that's where the frontiers are." In the two decades it's been orbiting Earth, the Hubble Space Telescope has revolutionized astronomy, probing the mystery of dark matter and showing that the first galaxies formed earlier than anyone ever thought. Experts expect the James Webb Space Telescope to have a similar impact. But unlike Hubble, which orbits close to Earth, James Webb will be far out in space, about 1 million miles away. This infrared telescope could be blinded by heat, so it needs to be cold — minus 400 degrees Fahrenheit. Part of the reason the telescope is so expensive is that a bunch of technologies had to be invented just to make it work, and it was hard to estimate their costs upfront. 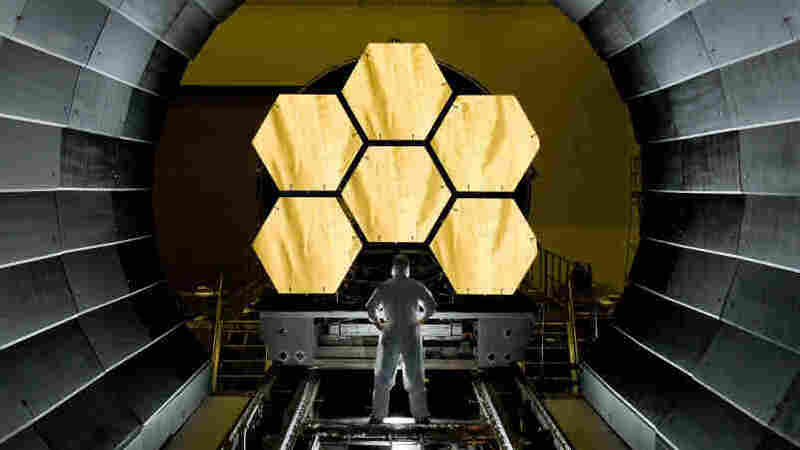 Matt Mountain, head of the Space Telescope Science Institute, points to innovations like its 18 gold-coated mirrors, and its five-layer sunshade the size of a tennis court. "There's a whole range of these new technologies which had to be brought in," he says. Mountain says the technologies they worry least about are the ones that "scare" people the most. Those are the "unfolding technologies" that make this a collapsible telescope. The James Webb Space Telescope is the size of a Boeing 737, but it has to fold up to fit in a slender rocket — then unfold once it's in space. And the whole thing has to work perfectly, because repair missions won't be an option for an instrument that's so far away. About $3 billion has already been spent. NASA officials are now hunting around for the extra money it will take to complete the testing and building. The agency also just shook up the telescope's management and put a new project manager, Rick Howard, in charge. Howard says some scientists do worry that James Webb could become the telescope that ate NASA's entire astronomy budget. "There are a lot of people that are concerned about that, there's no doubt about that," he acknowledges. Howard says it won't do that, and, in his view, it's worth the price. He also notes that it isn't the first telescope to be unexpectedly expensive — all in all, the Hubble program has cost around $10 billion. "It's interesting to think about James Webb vs. Hubble," Howard says. "When Hubble was launched, it was about three times the cost of what it was originally estimated at."